Int. diam loop = 97 by 93; W loop = 4.5, th loop = 2; bell L = 25, W = 26.5, th = 19.5; holes L = 11, W = 6 mm [RTS 17/12/2004]. Collected by Percy Horace Gordon Powell-Cotton and his wife Hannah Powell-Cotton (nee Hannah Brayton Slater) on 8th April 1933 during a shooting expedition [RTS 30/11/2004]. A narrow rectangular strip of yellowish brown animal hide (Pantone 7401C), with traces of light brown hair on the outer surface (Pantone 7509C), bent into a loop with one end pushed through a lentoid shaped hole in the other end to secure it. This may have been worn around the arm or leg. A series of 5 iron pellet bells have been threaded onto the strip; the hide has now hardened and these are fixed in place along the bottom. However marks along the strip suggest that there were either 4 additional bells in place at one time, or the existing bells have changed position. The missing bells could have been removed to make the circlet smaller. Each bell has been formed from an oval piece of sheet iron, bent over double but with the ends not touching, so that a narrow slit is left running along the lower edge, 4 to 5 mm wide. This produces a bell with semicircular or crescentic side view and oval plan view. The top face has been perforated with two oval holes in a row, punched from the outer face, through which the hide strip has been threaded. Enclosed inside each bell body is a loose spherical pellet of roughly shaped iron, that produces a jangling noise when each bell is shaken. The object appears to be complete - depending on the original number of bells - with traces of minor surface rust in places; the iron bell bodies are currently a metallic grey colour (Pantone 405C), while the internal pellets are a brighter silvery grey. The hide loop has an internal diameter of 97 by 93 mm, and is 4.5 mm wide and 2 mm thick. The bells are all of a similar size, with a typical example measuring 26.5 mm across the top, 25 mm in length, and 19.5 mm in thickness, while its holes are 11 mm long and 6 mm wide at their upper edges. The total weight is 123.8 grams. Collected by Percy Horace Gordon Powell-Cotton and his wife Hannah at Navera on 8th April 1933, during a shooting expedition. They did not record the Lotuko name for this type of object. 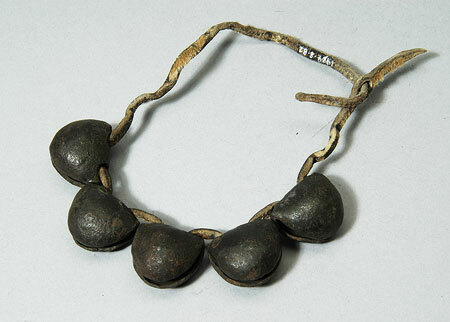 Similar loops of bells are also found in other cultures, such as the Madi or Ganda of Uganda (M. Trowell & K.P. Wachsmann, 1953, Tribal Crafts of Uganda, pl. 75F-H). These can be spherical or crescent shaped, and have various functions, being tied around the legs of toddlers, perhaps as a protection against evil spirits, and worn by witch doctors, magicians and brides (pp 324-5). This object is currently on display in the Court, case 77A. Accession Book Entry [p. 248] 1934 [insert] 8 [end insert] - MAJOR P. H. G. POWELL-COTTON , Quex Park, Birchington, E. Kent. Specimens collected by himself & Mrs Cotton, during hunting trips, 1933, viz: [...] [p. 252] - From the LATUKA tribe, NAVERA, TORIT, LARONYO. [p. 256, insert] 82-86 [end insert] - 5 iron pellet-bells mounted together on a thong. NAVERA (526). Added Accession Book Entry [p. 255] - 1934.8.83-86 not used - all part of single object, 1934.8.82 (RTS 8/12/2004). Card Catalogue Entry - There is no further information on the tribes catalogue card [RTS 28/5/2004]. Related Documents File - Typewritten List of "Curios Presented to Dr. Balfour by Major & Mrs. Powell-Cotton. Tribe Latuka". This object appears as item 526: "5 iron bells on thong, 8/4/33 Navera, about 4.30 N 32.30 E”. Also contains details of a cine film 'some tribes of the Southern Sudan', taken by Powell-Cotton during this 1933 expedition, copies of which are now in the National Film and Television Archive and the Powell-Cotton Museum in Kent [RTS 14/3/2005]. Sparks, Rachael. "Lotuko pellet bells" Southern Sudan Project (in development). 03 Jan. 2006. Pitt Rivers Museum. <http://southernsudan.prm.ox.ac.uk/details/1934.8.82/>.